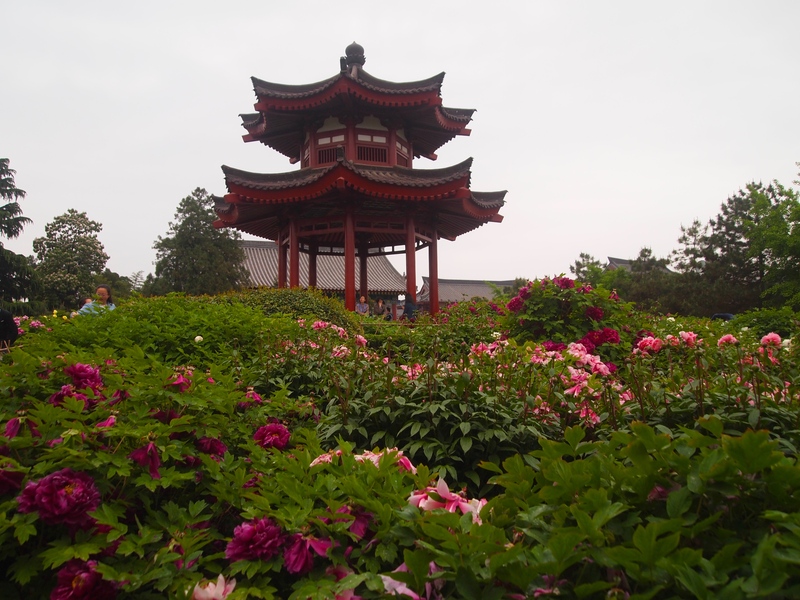 Saturday, April 18: After eating my Indian lunch, I wander into Daci’en Temple, home of the Big Wild Goose Pagoda in Xi’an. The skies are still quite dark and dreary, but the slight drizzle breaks occasionally. I’m surprised at how much I’ve been able to see on this day, in spite of the uncooperative weather. 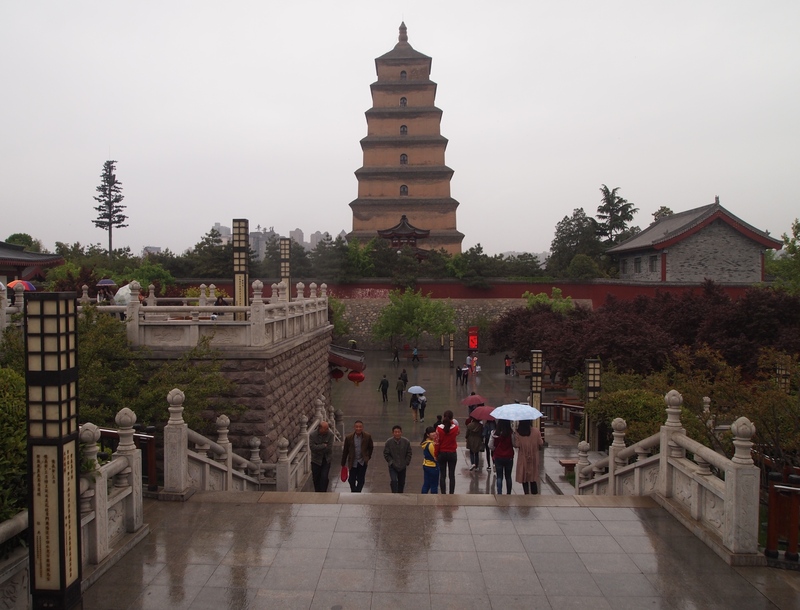 I can see the pagoda ahead of me, but it and the Daci’en Temple are encircled by a large wall. I have to walk quite a long way around the huge wall to find the opening. 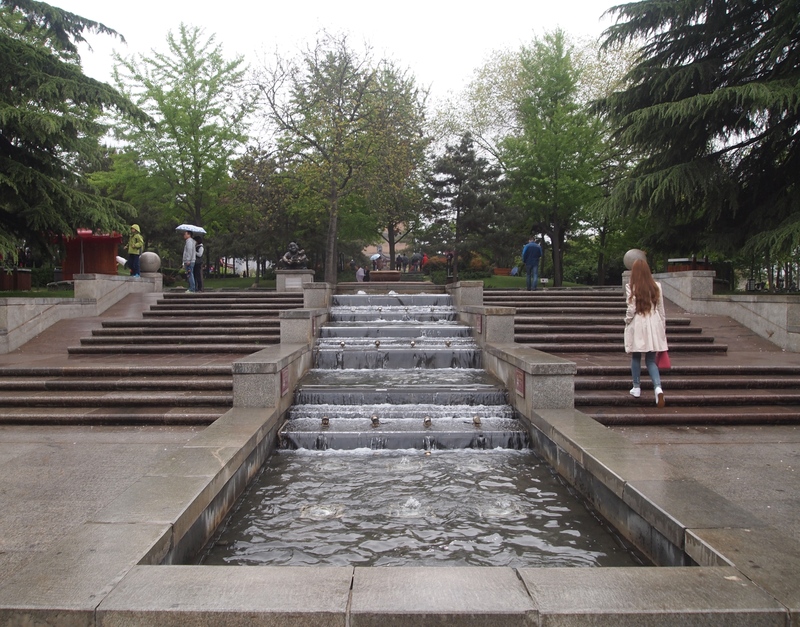 On the outside of this wall is where I find China at its worst: tacky souvenir stands, children’s rides, food kiosks and multiple music venues where loud, obnoxious and cacophonous music bombards the senses. 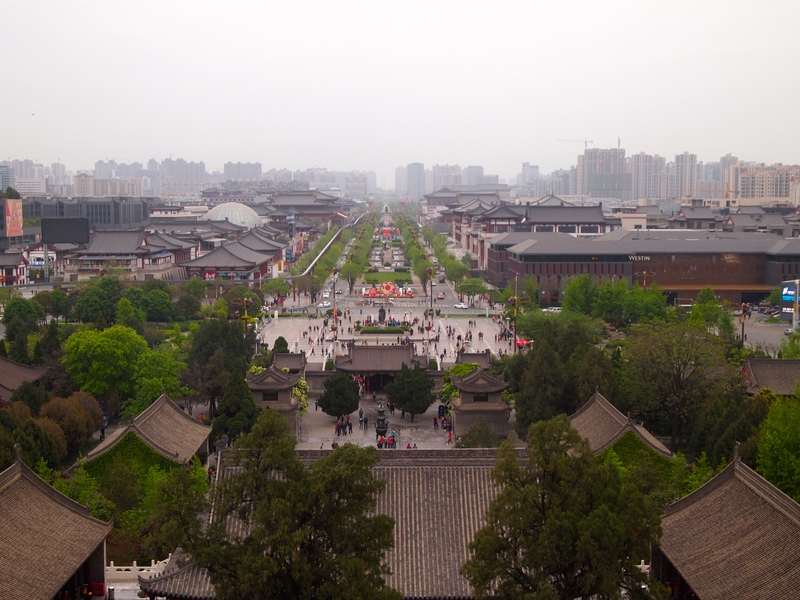 It’s the too-typical dog-and-pony show that accompanies many tourist attractions in China. It’s really too bad, because once I finally get inside the walls of the temples, it’s much more peaceful, although crowded, as always. 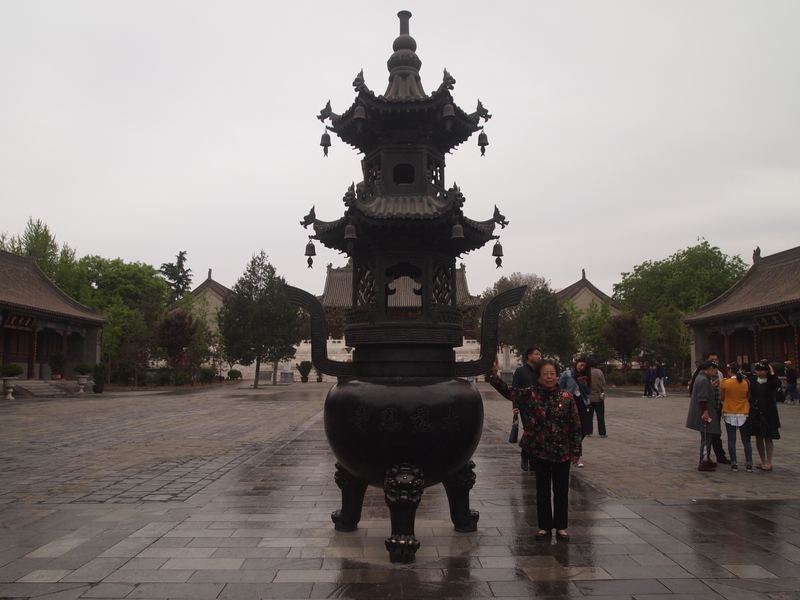 Once I finally get inside the walls, I encounter the usual incense burner with a Chinese woman posing beside it. 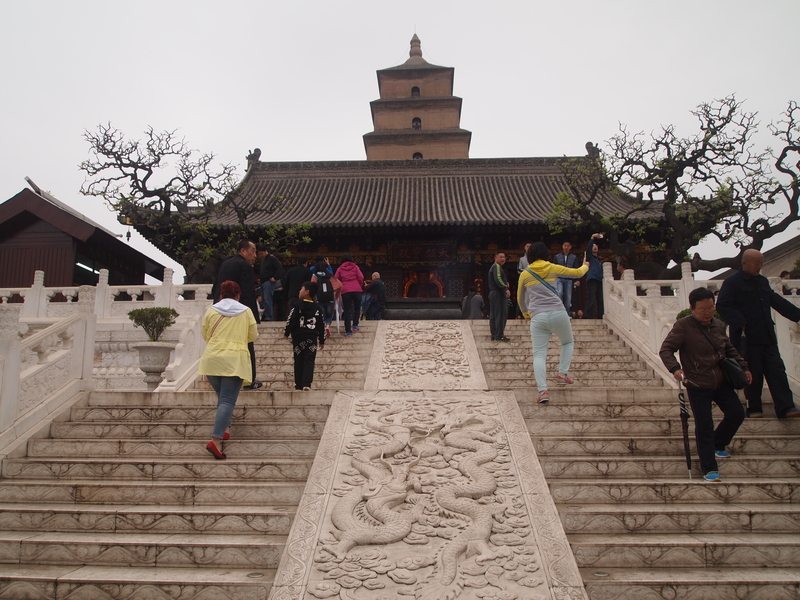 Walking up the stairs to the temple, I admire the dragon relief sculpture in the center. 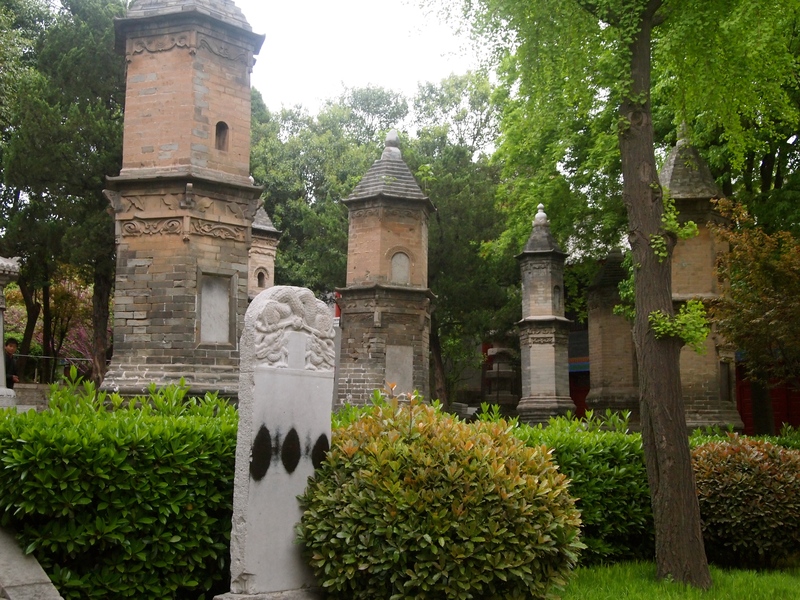 In 648, Daci’en Temple was built to commemorate the dead virtuous queen. In its heyday, it had over 2,000 rooms and over 300 monk residents. 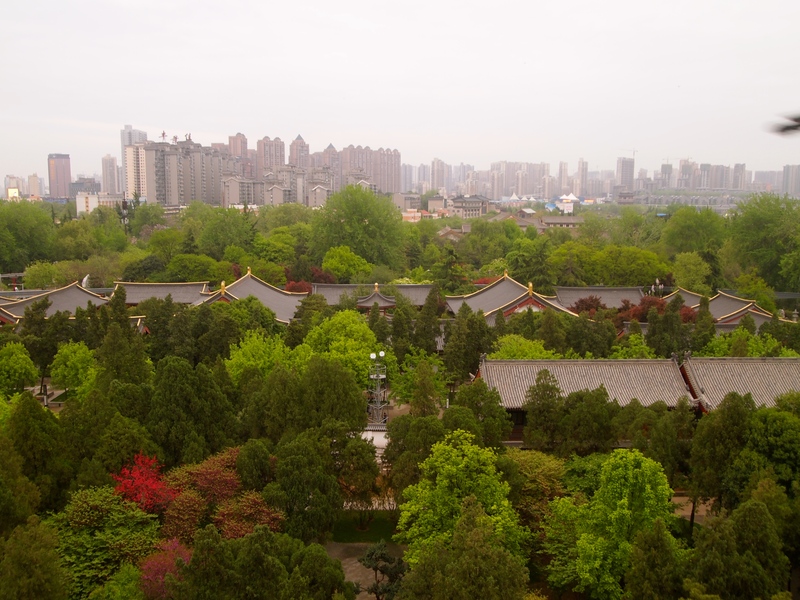 Today, it’s still quite grand, with an area of 12.5 acres (50,738 square meters), one seventh of the original area (Travel China Guide: Big Wild Goose Pagoda). 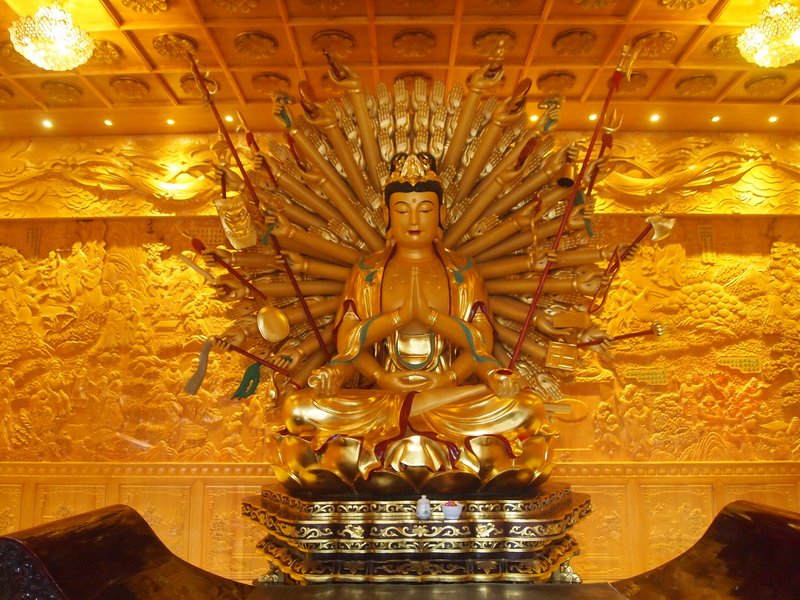 Inside I find a serene golden Buddha. 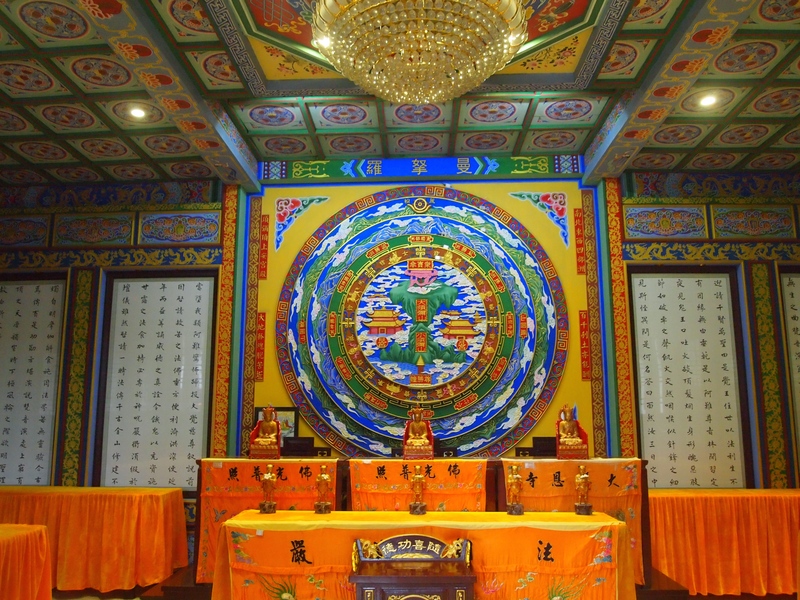 Manna Hall is a place where vegetarian hosts chant scriptures, ask blessings, dispel disasters, and pray for the deceased. Its service includes mainly yoga tanggal (from Tagalog: detachment) and repentance. Here, amrit, an immortal or heavenly wine, is consumed at the beginning of all sacramental rituals. Those who drink it can enjoy longevity, safety, strength and smoothness. Buddhists believe those who drink it can lead a long and secure life and go to a better world. 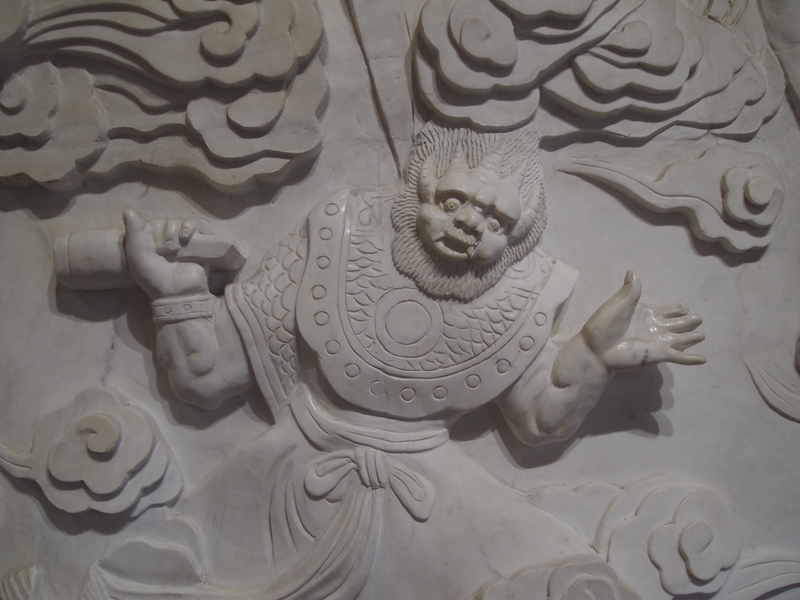 In Avalokiteshvara Hall, I find this bodhisattva with multiple arms, which symbolize his limitless capacity to perceive suffering and to help all beings. 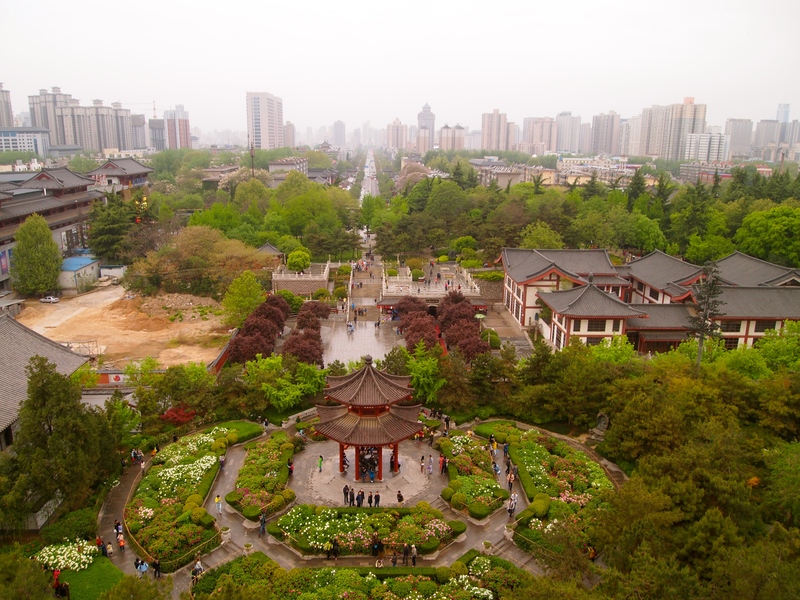 According to Travel China Guide: Big Wild Goose Pagoda: The Big Wild Goose Pagoda was originally built in 652 during the reign of Emperor Gaozong of the Tang Dynasty (618-907). 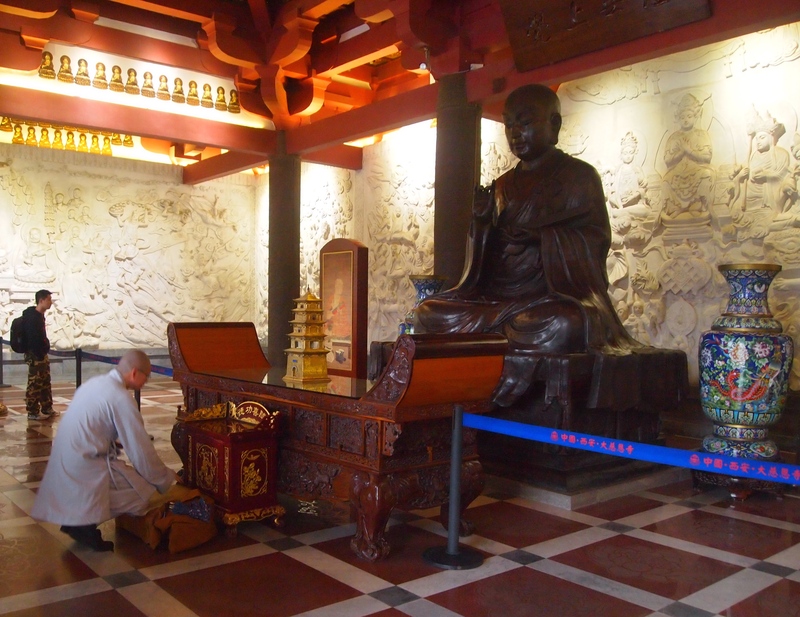 It’s function was to collect Buddhist materials that were taken from India by the hierarch Xuanzang. 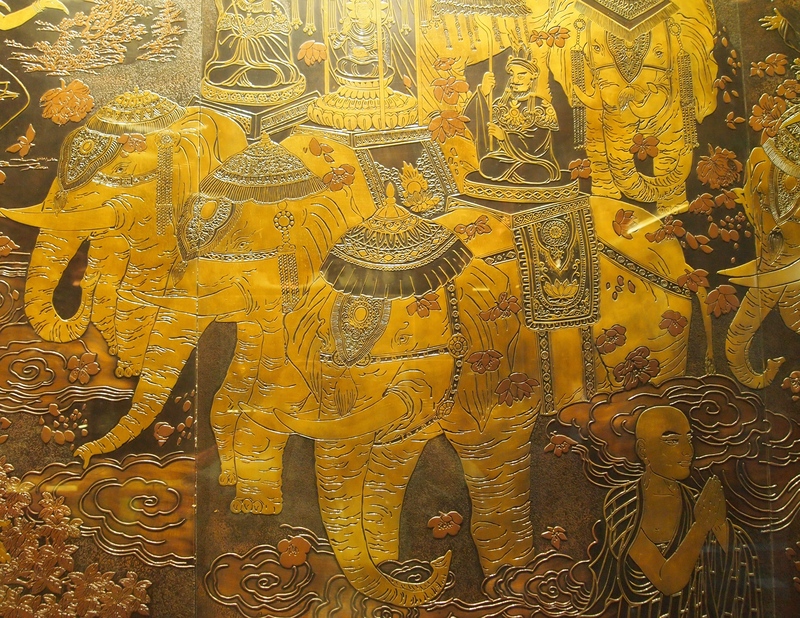 Xuanzang started off from Chang’an (the ancient Xian), along the Silk Road and through deserts, finally arriving in India, the cradle of Buddhism. 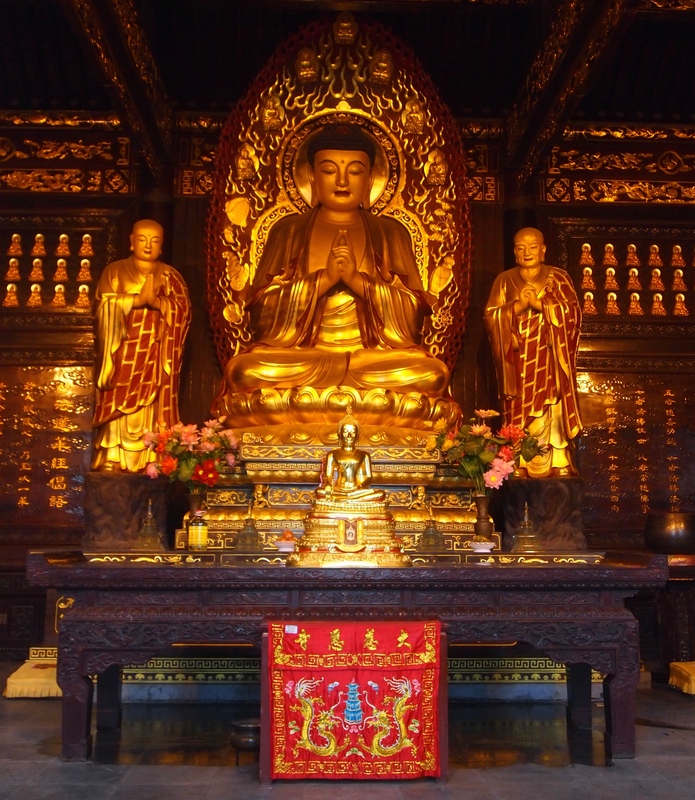 Enduring 17 years and traversing 100 countries, he obtained Buddha figures, 657 kinds of sutras, and several Buddha relics. 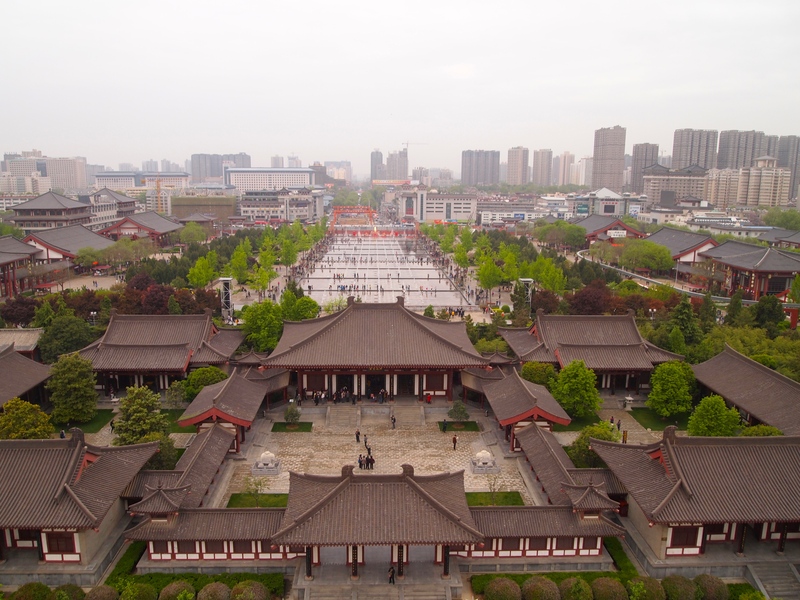 Having gotten the permission of Emperor Gaozong (628-683), Xuanzang, as the first abbot of Daci’en Temple, supervised the building of a pagoda inside it. 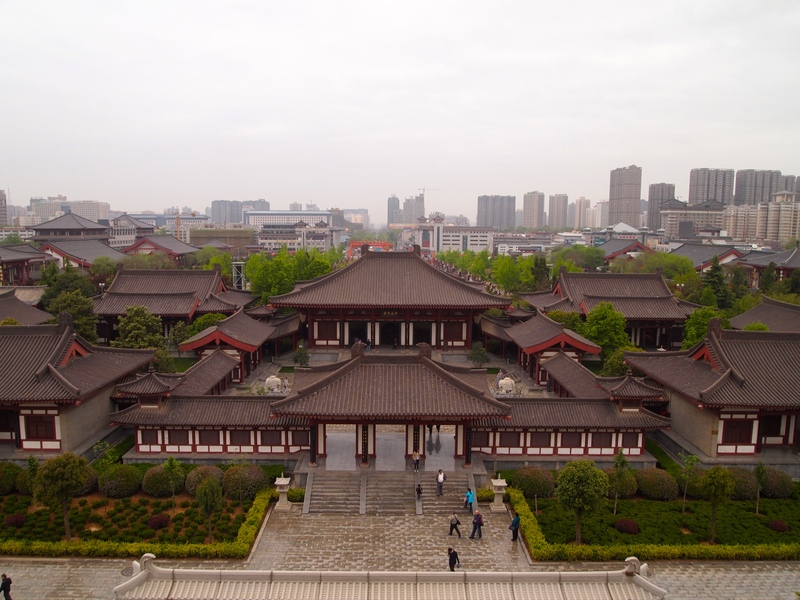 With the support of royalty, he asked 50 hierarchs into the temple to translate Sanskrit in sutras into Chinese, totaling 1,335 volumes, which heralded a new era in the history of translation. 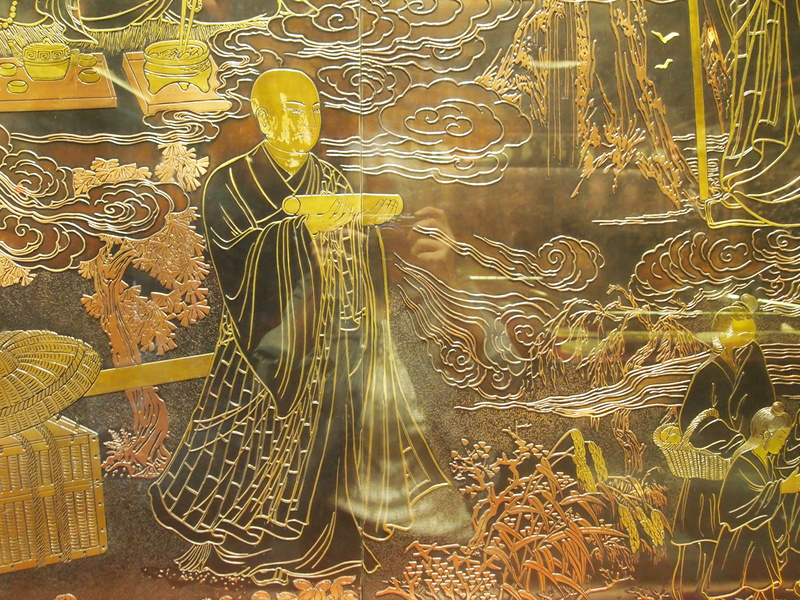 Based on the journey to India, he also wrote a book entitled ‘Pilgrimage to the West’ in the Tang Dynasty, to which scholars attached great importance. 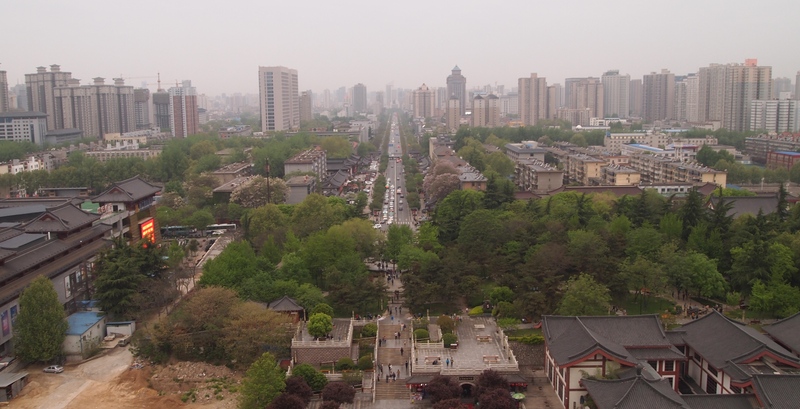 I climb up into the pagoda for some fabulous views of Xi’an. The entire seven-story structure leans several degrees to the west. 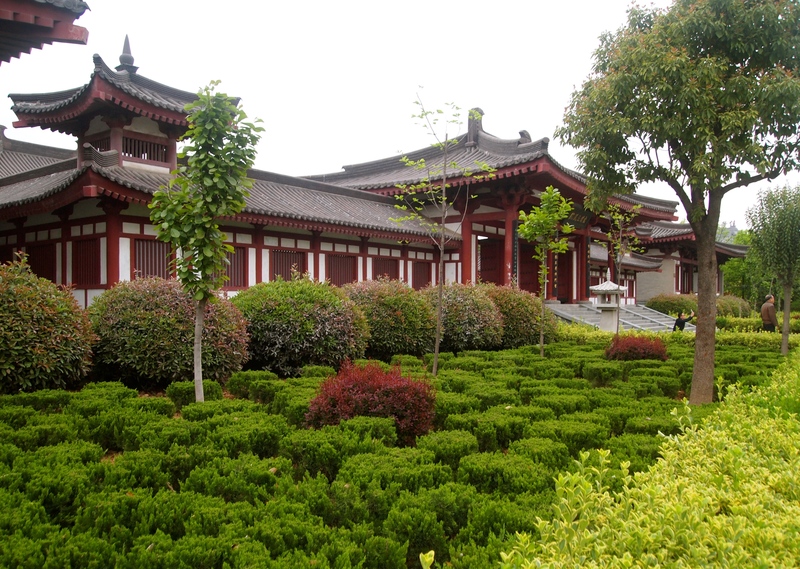 It was extensively repaired during the Ming Dynasty (1368–1644) and renovated again in 1964. 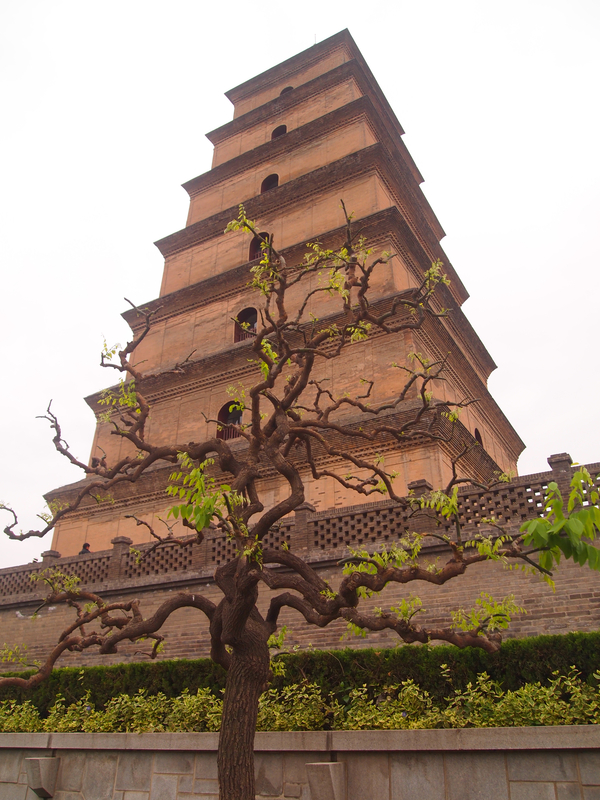 The pagoda currently stands at a height of 64 m (210 ft) tall, offering great views over the city. 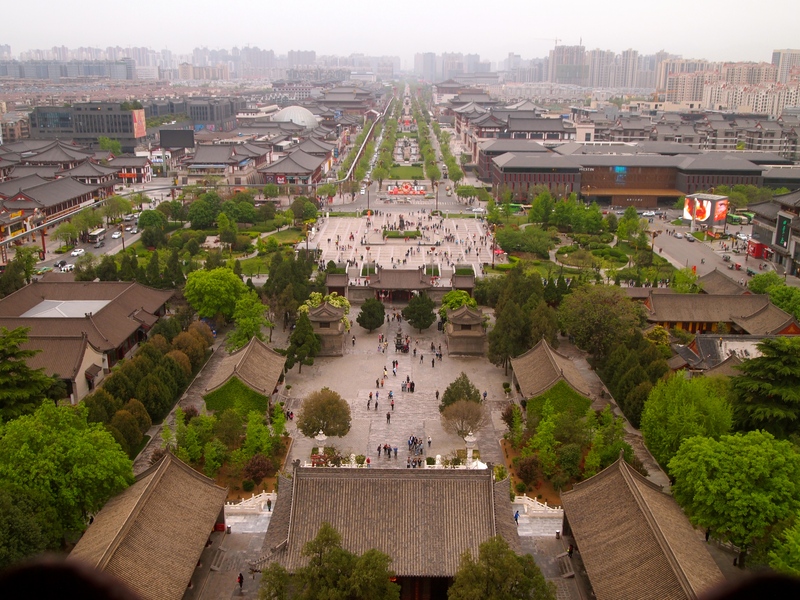 It was added to the World Heritage List on June 22, 2014, together with other sites along the ancient Silk Road. 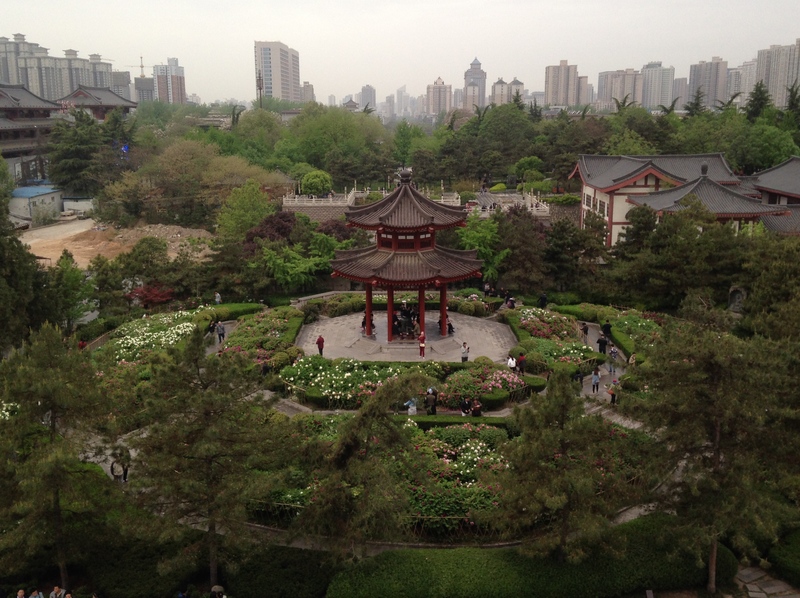 Even in today’s dreary weather, the views from the pagoda are fabulous. 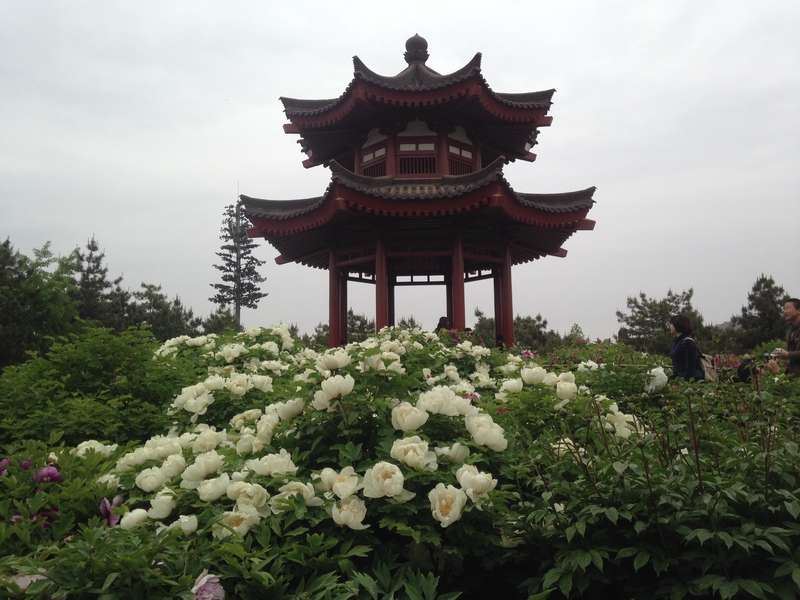 After coming down from the pagoda, I wander through the Peony Pavilion, where lots of Chinese people are posing for photos. 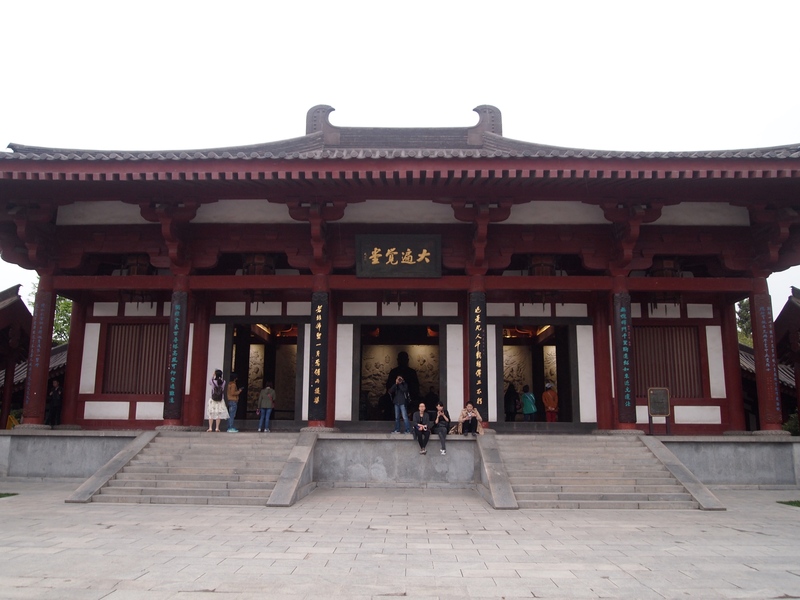 I walk through to the other end of the temple complex where I find a kind of museum. Inside, a monk first takes some photos of the Buddha and then kneels to worship. 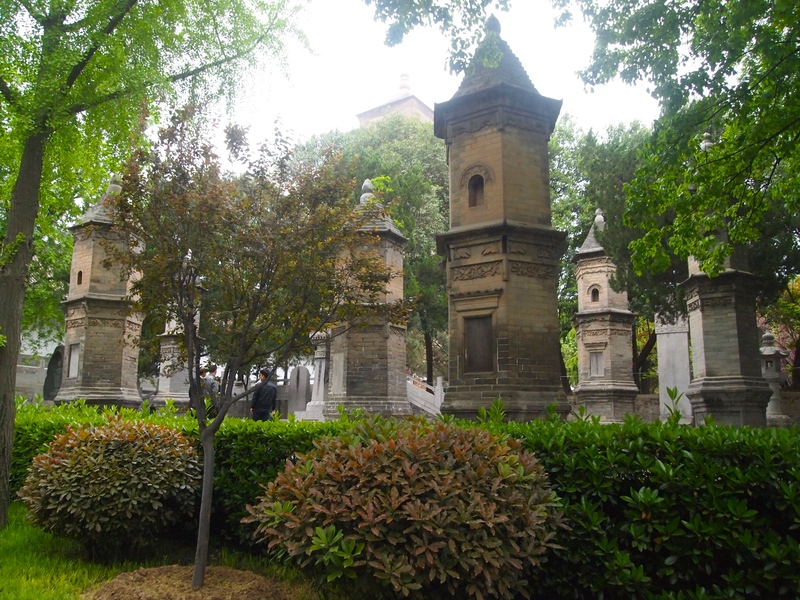 Finally, I make my way back out, passing this little garden of shrines. At long last, I head back to my hotel, where I rest a bit before going out to dinner. 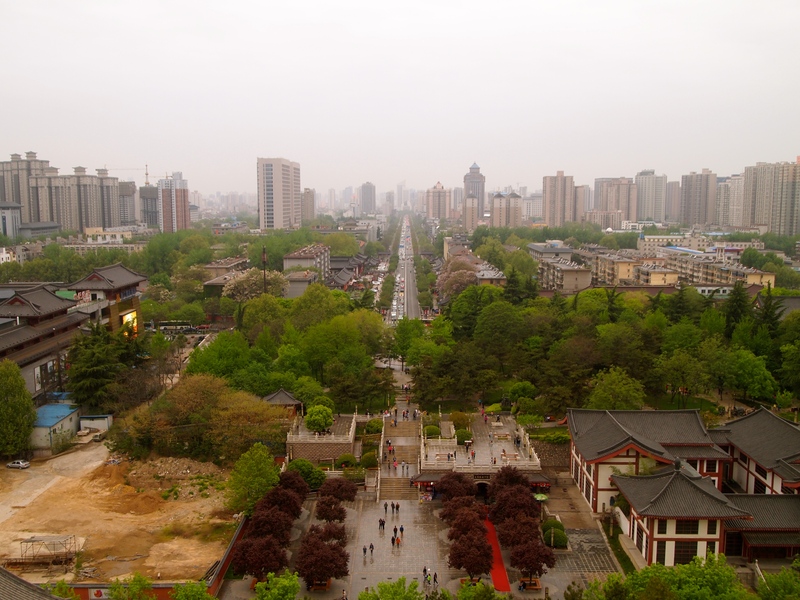 Xi’an was grey and rainy when I went. It was an interesting place but I thought the night market was by far some of the best food I’d eaten in China. Oh, I’m so sorry I missed your comment from back in June!! Thanks so much for visiting. 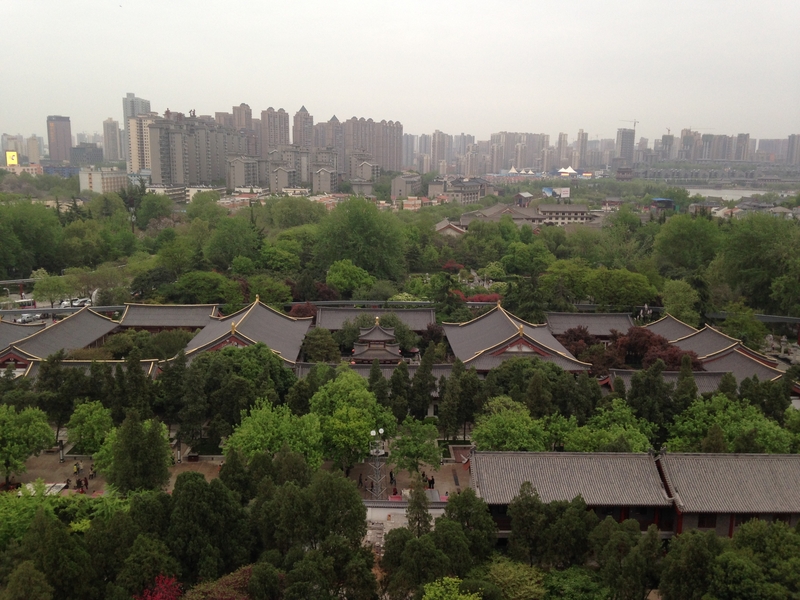 I had some cold, grey and rainy days in Xi’an as well, but luckily I also had some sunshine. I loved that night market and, you’re right, the food was delicious!! Isn’t it crazy that they allow all the tacky stuff to surround this beautiful place? I think tacky souvenir stands just seem to automatically come with tourist attractions wherever you are. It’s an economy booster – I guess. Hugs, darlin. Time to go walking.